Eucalyptus globulus is one of the most widely planted temperate hardwood species in the world, and in Australia there are 538,000 hectares growing in plantations. Although it has been reported as invasive, quantification of E. globulus invasion is rare. We conducted surveys at two geographic scales to assess the level of, and factors influencing, wildling establishment from industrial E. globulus plantations in Australian. We surveyed 290 km of plantation boundary, both within (22 %) and outside (78 %) the species native range. In areas of relatively high establishment, a density triggered paired plot approach (plots with and without wildlings) was used to assess fine-scale factors influencing establishment. We recorded 4,939 wildlings (17/km), 98 % of which occurred within 10 m of the plantation edge (maximum 175 m). Establishment varied between regions, ranging from 1.2 to 39.6 wildlings/km. Generalized linear models showed that the probability of a wildling being present increased with plantation age, that wildling abundance was higher along burnt transects, as well as sites that received regular, relatively high rainfall and had lower mean annual temperatures. The only fine-scale/local factor influencing wildling presence was the reproductive output of the plantation. The current level of E. globulus establishment in Australia is low in comparison to other invasive forestry trees. However, given the relatively young age of the Australian estate, local and regional variation in establishment, and potential future changes in plantation management, monitoring is warranted. 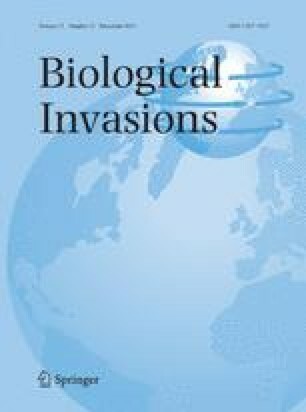 Implications for assessing the general invasiveness of Eucalyptus and possibilities for E. globulus wildling control are discussed. The online version of this article (doi: 10.1007/s10530-013-0492-1) contains supplementary material, which is available to authorized users. For providing access to plantations, maps and data we would like to thank: Hancock Victoria Plantations, particularly Stephen Elms and Phil Whitman; Australian Bluegum Plantations, particularly Ben Bradshaw; Elders Forestry, particularly Nigel England; WA Plantation Resources, particularly Matthew Kovacs and Sara Mathieson; Forestry Tasmania, particularly Stephen Read and Tim Wardlaw. For assistance with analysis we thank Grant Williamson. For assistance with GIS we thank Winston D. Smith. We thank the Australian Bureau of Agricultural and Resource Economics and Sciences, Canberra particularly Mijo Gavran for information and providing GIS data. We also thank Dave Richardson and the two reviewers for their comments that helped us significantly improve the paper. This research was funded by Forests and Wood Products Australia, the CRC for Forestry, and the TRANZFOR programme funded J. S. S. to travel to Australia.